Chances Are Your Pilot Isn’t a Woman. Here’s Why. This Seattle pilot shares her story about how women in the aviation industry battle pervasive gender inequity and the normalization of sexual harassment. This article was contributed by Kimberly Perkins, a Seattle-based pilot, founder of the nonprofit Aviation for Humanity and board member for the Pacific Northwest Business Aviation Association. Aviation is a highly romanticized industry. Culturally, we talk about the best aspects, which include exotic destinations, fancy first-class seating and courageous pilots. We read fascinating fighter jet stories and watch intriguing documentaries that augment the luster of the industry. Yet, a closer look reveals that nearly half of the population is left in the contrails. Women are drastically underrepresented in aviation – a situation that has not improved over time like other STEM fields. The reason lies in small fragments of a much larger cultural issue, and they are preventing the airline industry from effectively responding to a critical shortage of pilots. Where Are All the Female Pilots? In the United States, women make up 47 percent of the total workforce. But professional female pilots constitute five percent of the piloting workforce, a statistic that has remained unmoved in four decades. Compared to other STEM fields and “traditionally” male-dominated industries, aviation has one of the lowest percentages of female participants. There are mentors, scholarships, conferences, magazines and organizations that all have a goal to increase the abysmal five percent statistic. When experts are questioned on this topic, often the same old explanation is given: “It’s a pipeline problem.” It is more than that. While there certainly are fewer women training to be pilots, women also face gender-unique social pressures, double standards and systemic barriers that deter their entrance into aviation. Women have been interested in aviation since Wilbur and Orville gave up bicycles for airplanes at the turn of the 20th century. Women participated in air races throughout the 1930s and became test pilots and flight instructors during World War II. They have joined airlines and have become an integral part of the aviation industry. But there are uncomfortable truths that propagate the barriers keeping woman from playing a larger role in aviation. Many factors contribute to job satisfaction, such as salary, retirement, location, the duties of the job and potential for growth. Aside from salary, those slices remain relatively gender-neutral in the job-selection pie. A large piece of this pie, and often overlooked, is the topic of “soft issues.” Soft issues are human issues. They can include morale at the office, interpersonal relationships, the ability to approach management, a good work/life balance, sense of worth in the work product and the nebulous feeling of happiness at work. Soft issues are harder to measure quantitatively since they are subjective, yet they play a significantly important qualitative role in determining where people want to work. The answer to the why-are-there-so-few-female-pilots question lives in this piece of the pie. It is time we address the problems here in the hope of sweetening that slice. Bias can be conscious or subconscious; both forms can be divisive. An explicit gender bias is one made consciously and is a form of micro-aggression. For example, a female pilot keys the mic in response to Air Traffic Control. She is met with another pilot on frequency responding to her voice with the well-worn “another empty kitchen” comment. I have received a handful of these statements, always in the United States and always from a male pilot. An implicit bias is formed subconsciously, and often carries less intentional malice. When I was pregnant, colleagues and peers often asked me how I was going to manage being a parent and a pilot. I have worked with male colleagues with children the same age as mine. They have never been asked this question. There is an implicit bias that women are meant to give up their careers in order to become the primary caregiver for children. Implicit biases are more harmful to gender equality because they are insidious, more prevalent and seemingly socially acceptable. They perpetuate age-old stigmas and stereotypes that women have been fighting against for years. Flight attendants have been sexualized for decades and the stigma continues. The TV show Pan Am exemplified the sexual harassment that was endured airborne for decades. But the belittlement and marginalization did not end during the second wave of feminism; it continues today. As part of one flight attendant hiring process, an Asian airline throws size 0 and size 2 uniforms into the middle of the room. If you can’t fit into one, you don’t make it to the next round. I have met women who have had plastic surgery in the hope of increasing their chances of becoming a flight attendant. Flight attendants are a major part of safety and play an incredibly valuable role in the success of the flight; they are not there for viewing pleasure. Female pilots, too, experience sexual harassment. I have been told, “For a pilot, you’re pretty.” Years ago, I was told by a male colleague that I was hired to give the other guys in the cockpit “something pretty to look at.” Such harassment belittles a woman’s perceived worth. Nobody wants to be the “token” hire, and such antagonism makes for a hostile work environment. Over my 15 years in aviation, many of the men I have met are inclusive. These “good guys” are often ignorant of the large number of other men who make the flight deck a tough place for women. When I share stories of being called a “token” or having someone say “empty kitchen,” they are shocked and immediately attempt to discredit the occurrence. The surprise is whitewashing the systemic sexist issue. One cannot be part of the solution without acknowledging the problem. A chasm exists between our worlds. It is time we build a bridge. Ignorance is no longer tolerable. Rarely is a social injustice effectively addressed without assistance from the majority. We need men to stop justifying the behavior of their sexist colleagues and start defending the disenfranchised. At the very least, instead of being shocked, be outraged. When you Google “female careerism,” you get more than 60,000 hits. The same is not true when you Google “male careerism.” The double standard is perpetuated by some of the kindest people and sometimes in the subtlest of ways. How many working fathers are made to feel bad about their choice of keeping their career rather than becoming a stay-at-home parent? Some women do not want to end their careers, nor should they feel compelled to do so because someone else did. We can end this double standard and subtle sexism by being conscious of our word choice and ensuring we avoid language that promulgates societal inequities. Women have every right to the same career and family choices as men. While discussing work/life balance with my manager in a previous position, I explained the importance of attending my daughter’s recital. In an exhausted huff, with a twinge of annoyance, my manager said, “You chose to be a pilot, which means you’ll miss things.” I pondered that response for days, for weeks even. I’m sure many pilots, especially parenting pilots, have heard similar rhetoric. The statement promotes the notion that pilots cannot have a good work/life balance. It provides no solution, and it is apathetic in nature. Throwing one’s hands up and saying, “It is what it is” is the equivalent of throwing in the towel on developing a solution. I refuse to perpetuate the image that pilots have a poor work/life balance. And I refuse to accept that one must choose a career of flying or having a family life. I have heard the “you chose to be a pilot, which means you’ll miss things” statement in a variety of versions over the past 15 years. In every scenario, it has been a male colleague whose wife stays at home with the children. Not all families are structured as such. 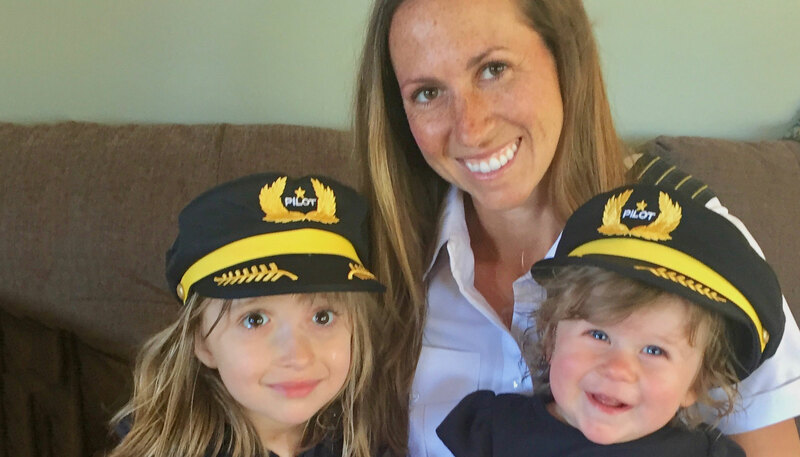 When compared to aviation dads, pilot moms overwhelmingly have working partners, which means no stay-at-home parent. This phenomenon means that mom pilots are overwhelmingly disadvantaged when it comes to flying pop-up trips and adjusting to last-minute schedule changes. Employing empathy is a basic, yet highly underutilized, managerial trait. We must all put our own biases aside and become cognizant that not all family structures support an equal work/life balance for all employees. Therefore, negative rhetoric does little for employee encouragement. Insist on having a diverse group of candidates. It is not about lowering any standards; it is about removing obstacles that hinder others from joining the process. Ensure your hiring practices do not exclude diversity by insisting the new hire look and think like everyone else. Such biases perpetuate an exclusive old boys club, which could affect productivity and workplace creativity. Studies from MIT and a variety of think tanks show that diverse groups make better decisions and are more productive. So, evaluate your hiring practices to ensure you are not subconsciously limiting your potential by hiring only those that look and think like you. Aviation remains very much an old boys club, which is a homogenized network of people that look and think alike. It can be difficult to break into the cliques and break down the clichés. Women are at a disadvantage from the start since they lack direct access to networking, the passing of information and access to resources, which could provide immeasurable benefits. When I was a young pilot, I looked around my flight school at a classroom filled with young men and where hallways were lined with posters of male pilots. As I moved through my flying career, I was never lucky enough to encounter a female manager mentor. As I looked up that corporate ladder, it was a sea of men. Such an environment can be lonely, unwelcoming and intimidating, which is why establishing a mentoring program is critical. Beyond basic human rights and morality, we have ample justification to end the gender bias in aviation. The pilot shortage can be rectified by accessing a great populace and the retention of employees can be resolved when we use a multifaceted lens to evaluate why women are consistently underrepresented in aviation. The reason lies in the soft issues that are hard to quantify but vitally important to evaluate. In order for the aviation industry to be resilient, it must grow with modernity. We have parked the old DC-3s and retired the need for flight engineers. Let us also park the sexist rhetoric, Top Gun chauvinism and subtle biases that keep half of our population from joining our industry. With these changes, we can sweeten the aviation pie. Kimberly Perkins is a mother, daughter, wife and career pilot. She is an international jet captain flying for 15 years. She is the founder of the nonprofit Aviation for Humanity and on the board of directors for the Pacific Northwest Business Aviation Association. She has piloted airline and private executive jets on six continents. She lives in Seattle.